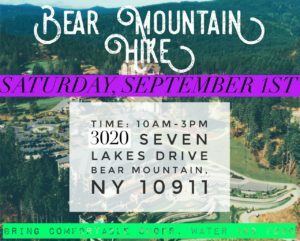 On September 1st 2018, we were able to plan and enjoy an amazing day at Bear Mountain, NY. Our trip involved clients and distributors getting together as a family and setting our goals to reach the top of the mountain. The trail was inviting but also arduous, 1.4 miles long, with challenging natural obstacles that pushed our limits. We were a group of 81 hikers of all ages from a new born baby (stroller and all) to grandparents. At the start, we were blessed with beautiful cool cloudy weather and reached the top to a gorgeous clear sky. We made history by working together and helping each other reach the top, it was an amazing experience. We are looking forward to having the same event next near, with an even bigger group next time. Thank you to all the members and distributors that participated and made this possible. Below is a cute video for our experience on the trip.